Today, August 25th, the National Park Service celebrates its centennial- 100 years strong of amazing national parks. 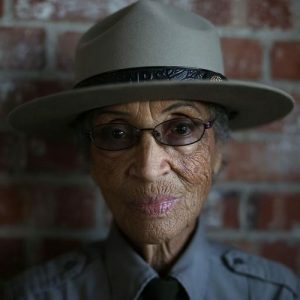 Almost as amazing is 94 year old Betty Reid Soskin, the oldest working national park ranger in the US. Stationed at the Rosie the Riveter WWII Home Front National Historic Park in Redmond, California, Ms. Soskin has her own impressive history: the great granddaughter of a slave, she’s had a varied career in academia, social activism, business and now a park ranger. Determined to make sure our country remembers the history of African Americans and their contributions to our country, Betty states, “What gets remembered is determined by who is in the room doing the remembering.” You surely won’t forget who Betty Reid Soskin is when you Read Here.